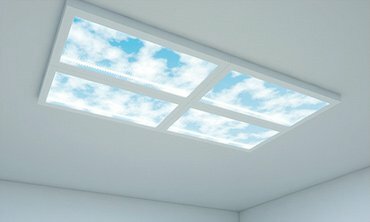 TeucerLUX is an award winning product which substitutes natural daylight when and where it is not possible to have it. It is designed for use in human centric lighting applications. 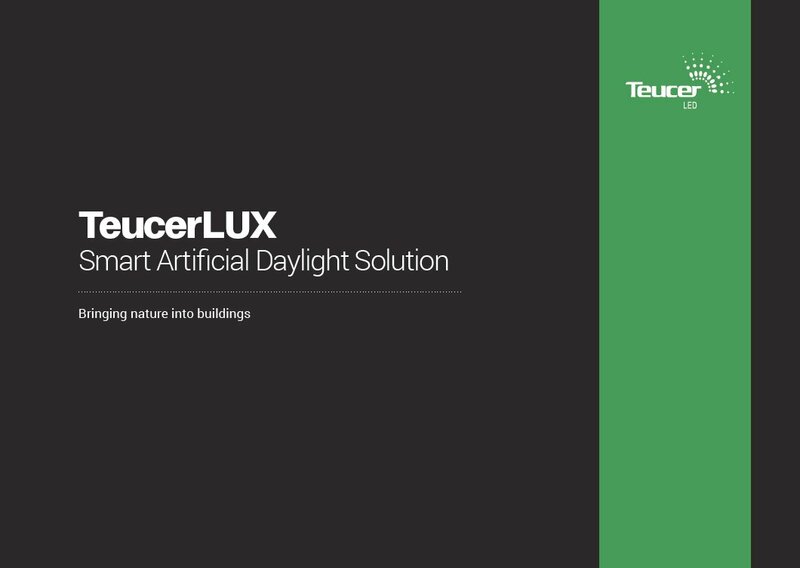 The TeucerLUX system is a smart artificial daylight solution for dark areas which lack natural light. It mimics daylight and a sun shining effect within darker indoor areas, instantly transforming spaces by enhancing them with plenty of brightness and virtual daylight. TeucerLUX has the ability to mimic a particular natural lighting effect from any geographical location at any time of the year. With a simple adjustment of the date, time and latitude, TeucerLUX will automatically synchronise your lighting ambience. For example, you can bring the effect of a sunny, summer morning in Melbourne into your London home, during a rainy November evening. TeucerLUX mimics the daylight and reproduces a vivid scene with sky, clouds and sunshine, enhancing the body’s daily rhythm to function properly, stay healthy and feel well. TeucerLUX has the ability to mimic a particular natural lighting effect from any geographical location at any time of the year. For example, you could bring the effect of a sunny, summer morning in Melbourne into your London home, during a rainy November evening. TeucerLUX is a high quality product which substitutes natural daylight when and where it is not possible to have it. Whether you use it in the office, gym, basement or any other location, it will give you the feeling of sunshine indoors. TeucerLUX utilises different colour temperatures to achieve the look and feel of `the great outdoors` inside. This can be adjusted from 2500K to 10000K. There are four pre-programmed mode settings which mimic daylight effect: Morning, Noon, Evening and Cloudy. TeucerLUX smart artificial daylight solution reproduces natural light, which combined with the colour of the sky and clouds provides a bright and happy ambience. TeucerLUX is a high quality product which substitutes natural daylight when and where it is not possible to have it. Whether you use it in the office, gym, basement or any other location, it will give you the feeling of sunshine indoors. The main difference between TeucerLUX and other general electrical lighting sources is the lighting pattern. 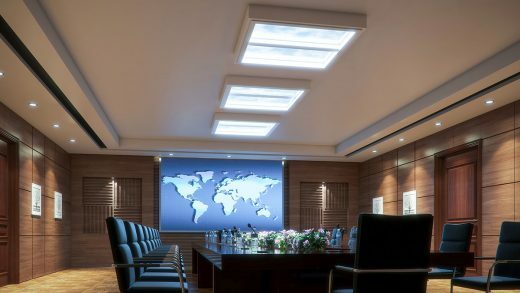 TeucerLUX creates a daylight atmosphere, while other lighting sources are providing only illuminance. The lighting effect simulates natural daylight which allows you to create both a bright and relaxing ambience. The control system enables you to change the lighting according to current daylight in a 24h cycle, meaning it corresponds to our internal clock. TeucerLUX perfectly integrates the latest LED technology, optical design and intelligent control system. 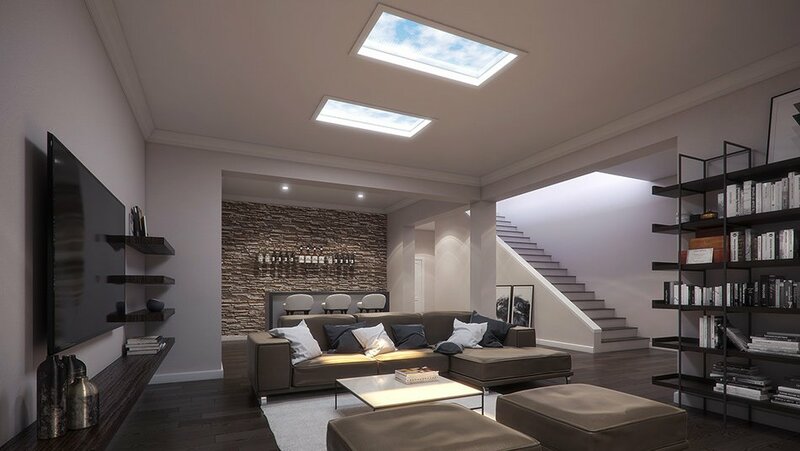 This artificial skylight panel is designed to be mounted on ceilings. It enables control of daylight brightness by adjusting the intensity. This can vary from the position ‘0’ – which gives the effect of a cloudy day, expanding to the position ‘100’ – which provides the highest intensity of a sunshine effect. TeucerLUX utilises different colour temperatures to achieve the look and feel of `the great outdoors` inside. This can be adjusted from 2500K to 10000K. There are four pre-programmed mode settings which mimic daylight effect: Morning, Noon, Evening and Cloudy. Additional manual options are available for further effects. For many years, civilisation has revolved around daylight. Discussing the benefits of natural light wouldn’t have ever occurred to anyone before the end of the 19th century. Advances on modern reality mean that our living and working patterns have changed and we’ve become very dependant on artificial light. Ensuring we get a sufficient dose of daylight is key to our physical and psychological wellbeing. Latest research suggests, we now spend close to 90% of our lives indoors – this means that it is difficult to truly experience the benefits of natural light, as we simply don’t get enough of it. Thankfully, the benefits of natural light are now well-researched and documented. 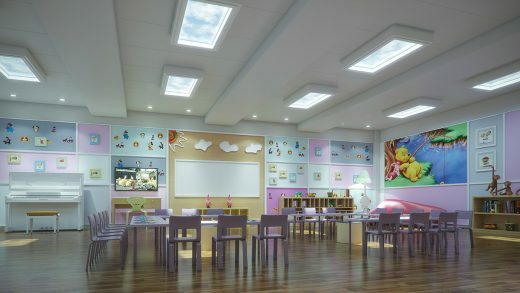 The research shows a variety of benefits from exposure to daylight, such as an improvement to an individuals general health and circadian rhythm, improved patient recovery times in hospitals, improved student educational performance in schools and increased worker productivity. Our ancestors may not have had artificial lighting, but we are unable to hide from the fact that in today’s world it’s an important part of everyday life. While daylight may not be the most integral part of existence that it used to be, there are numerous benefits to natural light. Understanding the effect natural light has on the way we feel, how productive we are, and the buildings we spend so much time in is vital to improving our advancing modern existence. The true value of light lies in the combination of excellent visual, biological and emotional benefits. Human-centric lighting puts people first. Developing appropriate human-centric lighting — or lighting for health and wellbeing — is more than just delivering lumens in a finite spectrum. Brightness alone isn’t an indicator of quality lighting and neither is a static correlated colour temperature (CCT). The timing, pattern and amount of light matters to the human biological system. Studies have found that well illuminated spaces with natural elements such as daylight can improve efficiency. Given the demands of modern business, having environment that brings out our best is becoming increasingly important. Getting daylight distribution is the key to creating workplaces brimming with creativity, productivity and wellbeing. It is a prerogative for any business to capitalise on the benefits of natural light by providing a healthy dose of daylight, ultimately securing a more active and focused workforce. 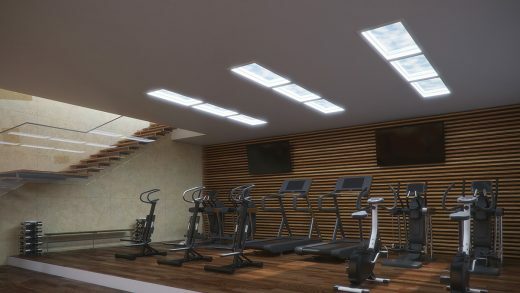 Daylighting in recreational facilities allows people`s moods to be bolstered. 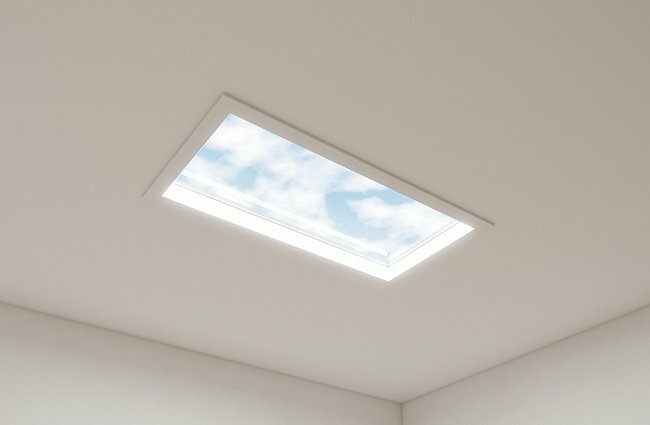 A proper daylighting strategy is an effective measure for people to garner as much energy as possible and push their bodies to be in peak condition. It is recommended to maximise exposure to daylight for optimizing recovery, immune system and bone health, sports performance, and building muscle. A proper and effective daylighting strategy in recreational facilities will improve the well-being and performance. Light is critical to human functioning, it allows us to see things and perform activities. But it is also important because it affects human beings psychologically and physically. 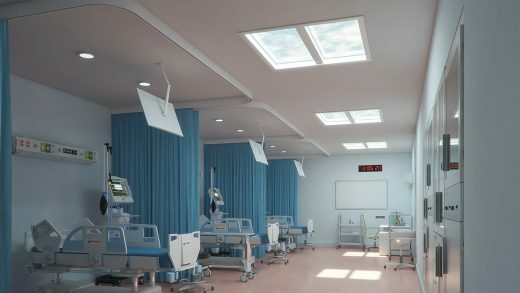 By controlling the body’s circadian system, light impacts outcomes in healthcare settings by reducing depression among patients, decreasing length of stay in hospitals, improving sleep and circadian rhythm, lessening agitation among dementia patients, easing pain, and improving adjustment to night-shift work among staff. Studies have shown that natural daylight can improve exam results by up to 26%, as well as having a positive effect on rates of attendance and the health of children. 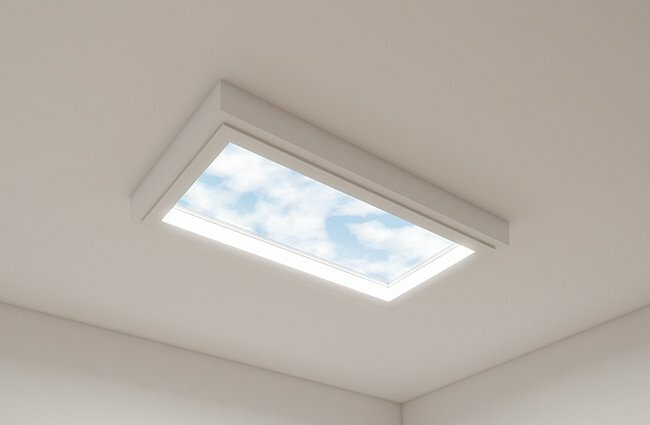 Aside from the physical and psychological benefits, natural light also offers an environmentally friendly means of saving money on energy costs. Exposure to bright blue light during the day boosts mood, alertness, concentration and energy levels. The materials used in the production of TeucerLUX combine several new, cutting-edge optical technologies. New nano materials and toughened glass with micro-structures are producing unique lighting patterns and an authentic sky effect. Two TeucerLUX models are available. 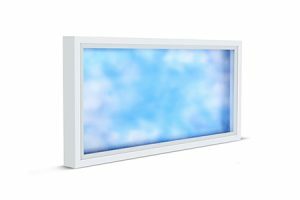 CloudView model, which is producing a stunning blue sky effect with additions of authentic clear white clouds and TrueBlue model which is producing an impressive clear sky effect. 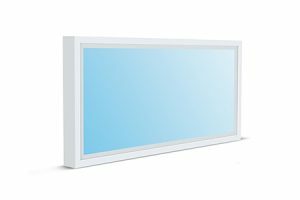 TeucerLUX units are easily mounted on any ceiling, using surface or recessed, single or double frames. The event about the latest trends in Human Centric Lighting and official launch of innovative and an award-winning product ‘TeucerLUX’ was held at ‘Home House’, a Private Members Club in Marylebone, London. The guest speakers, Dr Peter King-Lewis, Ms Lucy Martin and Mr Goran Krizanec have presented insightful lectures on what is the impact of light on human body, how Human Centric Lighting is working in practice, and how LED technology and the smart lighting control system in the ‘TeucerLUX’ can match light characteristics which positively impact the natural human circadian rhythm. Dr Peter King-Lewis is a Private GP, founder of the King-Lewis Family Practice and Office GP Ltd. At the event ‘Daylight - A New Dimension’ held in London, Dr King-Lewis presented an insightful lecture ‘Impact of light on Circadian rhythm’. The highlights include what effects and benefits the light has on human body and how it affects our cortisol and melatonin levels, as well as our circadian rhythm. Dr King-Lewis lecture addressed what are the benefits of exposure to daylight and how the non-visual effects empower our wellbeing.